Updated: February 2016 with new resource links. The fact that there’s a fountain of research studies, surveys and books, on the topic of “making meetings better” says to me that these necessary evils leave much to be desired. Their structure, impact on morale and staff productivity seems to be discussed frequently. From my point-of-view I wanted to know: 1) why do meetings cause such dread and 2) is making them shorter the answer? In my research I found tons of best practices on how to conduct shorter meetings, how to keep meetings productive as well as statistics on how much of our day we’re stuck in meetings. The study I found most informative covered how employees feel about meetings and why they feel that way. My simple-syrup reduction from this 26-page study is: meetings are considered an interruption. Nobody likes interruptions. Even when meetings are planned, they cause a perceived down-shift in productivity and upswing in mental expense, for possibly little reward. We dread meetings, we dread planning for them, participating in them and when they’re long, we’re too wiped to feel relief when it’s all over to actually be productive again. Experiments of Professors Luong and Rogelberg1 revealed, the more meetings one has to attend, and the more time one spends in meetings, the greater the negative effect. They go on to reveal meetings that start late, lack structure and run long are the most dreaded. Furthermore, the indication of the meeting starting late or starting without all of the invited parties had a direct effect on the perceived outcome of the meeting (i.e., starting late = poor organization = running late = major dread). In my experience, I have NEVER attended a meeting that ended early where someone left upset about it. On the contrary, I see smiles as they walk away with pep in their step like they just got a free milkshake or an unexpected discount. So I wonder, do shorter meetings in general relieve this dread or is setting expectations for long ones and delivering short ones the key? Maybe a little bit of both, but I found more research to support the former. This graphic shows when people are paying attention in their meetings versus when they lose focus doing other things, like checking email. Their review of thousands of meetings revealed the optimal length of a meeting based on how long people tend to pay attention and at which point they tend to drift off. Ray Williams, executive coaching professional, sites numerous studies, surveys and resources on “why meetings kill productivity.” One survey from Industry Week, of 2000 managers, said at least 30% of their meetings were a waste of time. 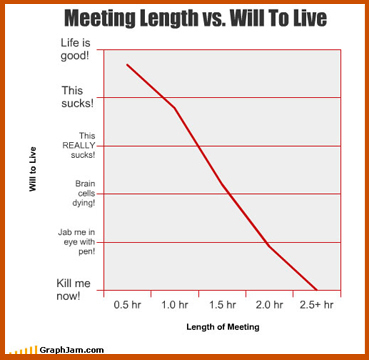 I think the, “Meeting Length vs. Will To Live,” sums it all up, shorter meetings = less dread. 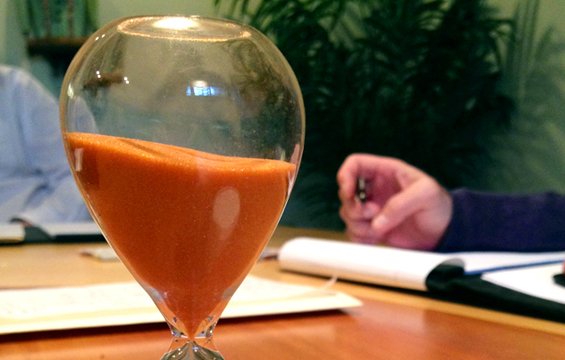 Here are a few resources for more productive, shorter meetings. Dummies.com has a good article with tips on conducting effective business meetings. Hello Focus, was created on the very principal that you can get more done if you stay focused. 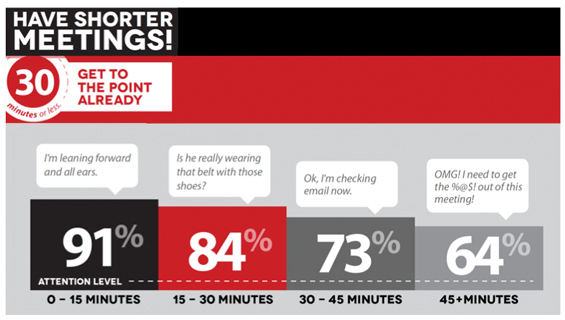 Here’s a great article on productive meetings. Percolate, a technology company focused on managing marketing activities, provides their six meeting rules. #1 takes the cake! If you have some resources you’d like us to include in this shoot me a comment and we’ll keep the tips coming. work culture a little happier + healthier. 1) A study by Luong and Rogelberg (2005), Employees’ feelings about more meetings: An overt analysis and recommendations for improving meetings. Personally, I won’t attend a meeting unless it has an agenda and/or I know *precisely* what we’re going to be focused on during the discussion; even then, I start each meeting by laying out our expectations of the meeting (i.e., what are we trying to achieve)… even if the meeting isn’t being hosted/sponsored by me. Tangential conversations are often valuable, but hold yourselves accountable with specific meeting objectives—and don’t be afraid to use them. FWIW, I learned the trick of setting meeting expectations from a certain smartypants named Bev Murray; you may know her. Thanks Alex! I agree completely, and like you, i’m always the one asking … “what’s the goal of this meeting?” before it even starts. Setting expectations are a huge part of making a meeting successful from a business and an emotional standpoint. Everyone wants to leave feeling like their time was well spent. I totally agree with Alex – clear objectives, agenda and timings if possible. We are pretty geeky about this stuff as we chair around 250 board meetings every year. So much so we are developing an online meeting manager to help. It’s called magicminutes.co.uk and it would be great if you took a look and let us know your thoughts. We are working on a version 2.0 at the moment, the free version is due for launch in the next couple of weeks. The fully featured version allows you to set the agenda, identify who is preparing for that item and get them to upload something, collate a ‘board pack’ with all the contributions, run a timer for each agenda item and so on. Like I said, we’re quite geeky about this. I’d really appreciate your thoughts. It’s nice to know other people are thinking about this stuff. Thanks David! I’ll check it out.